Best POS System is a Clover reseller. Clover is an all-in-one business management tool which offers far more than your standard POS. As well as taking multiple payments which include credit and debit, chip and mobile solutions, you can manage staff and inventory, view reports and analytics and even build a loyalty scheme with your customer data. Clover staff are industry experts. They work in Silicon Valley which is often called the center of technology. There are over 150,000 merchants currently processing with Clover POS, and the company delivered its 500,000th device in December 2016. One of the best things the Clover POS has going for it is the large, easy to read touch screen. This makes the visually driven interface simple to use. The downside is that it’s a fully proprietary product so it’s not based on Apple or Android technology. That means you can’t use an existing tablet you may have and just download an application to make the system work for you. This limits your freedom a bit if you prefer one type of technology over the other, or if you want to make your tablet talk to other systems on your network, but will dramatically decrease any compatibility issues and set up time. Clover was designed with some seriously competitive reporting and insights. Transaction data can be analyzed to unlock sales trends, see who is buying what, when they’re buying it, and which location they’re buying it from. You can also get a competitive advantage with data from the web that allows you to track competitors and analyze their performance against yours. The insights also examine various geographics and demographics. If you’re thinking about expanding, Clover offers tremendous insights to help you find the best location for growth. With real time reporting combined with historic data, you’ll have everything you need to make informed decisions. For a small business owner, data can put you at a serious advantage over competitors as you get inside the heads of your customers. 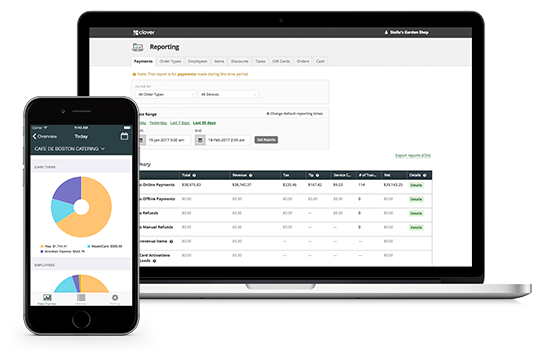 Clover provides an impressive amount of information for running back of the house operations, including everything from inventory management and employee reporting to merchandising and marketing. 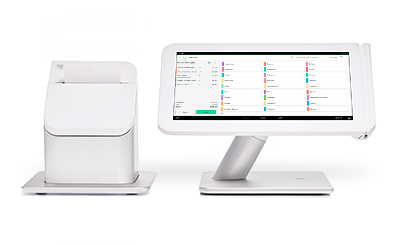 While the system may not be used freely on Apple or Android, the proprietary design of Clover’s POS systems (running on its own Android device) provides a visually driven interface with a large and easy to use touchscreen. Navigation is simple and done with simple touches, using visual menus that make it easy to find everything you need. It’s a very intuitive design that resembles a typical smartphone device. You can customize the layout, making it easy to locate functionality and improve the comfort and efficiency of your POS system. When you order Clover it arrives pre-configured for your business with minimal assembly required. Simply plug in the system, get it online via Ethernet or WiFi, boot up the system and start the final setup process to get your products loaded. If you have any difficulty, Clover offers a detailed run-down of the setup process on their website as well as customer service options to speak with a representative. This mini device is a compact countertop device that has the capacity to grow with your business. Created with small businesses in mind, the mini does all of the basic features that you need from a payment processing solution and when you combine all of the add-ons it becomes a full featured POS. Clover's mobile device is ideal for on-the-go businesses, such as food trucks, pay-at-the-table restaurants, or any other business where customers require quick service. Clover Mobile accepts a full suite of payment types, such as EMV chips, credit and debit cards, and NFC payments. It's designed for fast and secure transactions, and can grow with your business as well. This is Clover's main countertop POS system and featured POS product. It contains standard POS abilities and more. With the Station you can make payments, track inventory, manage time sheets, run reports, cync with other devices, and more. This product is built for established businesses to integrate to a POS system and can grow as you grow as well. Clover Go is the all-in-one EMV chip, card, and contactless payment reader. It's ideal for on-the-go businesses and connects with other Clover devices. Best of all, it integrates with all reporting and sales activity and business insights to help your business grow based on data. Cost is one area where there’s a bit of a barrier for entry. While the system was designed for small to mid-sized businesses and it offers a comprehensive suite of insights and reporting (with a lot of feature potential) the POS system itself can be costly. Because the POS system can be purchased from a variety of merchants the price can vary. The Clover mini POS terminal runs at around $400 while the complete terminal with register, printer, scanner, terminal and touch screen is typically $1,000. If you require more than one POS station the startup cost can run into the thousands. This is a significantly higher setup cost than with many other POS systems that allow for simple leasing models. However, you do have the option to purchase 2-3 minis, which will cost you somewhere around $1,000. Because Clover was acquired by First Data and their ISO’s, you’ll be required to use that company for merchant processing which may include a contract and termination fees. You’ll need to consult with a representative for merchant processing to get specifics on your negotiated rates and contract terms. Fresh out of the box you get a wealth of insights and reporting but the overall features of the POS system are pretty bare bones. There is an app marketplace that allows you to expand on the native functionality and features of the system. The benefit to this is it lets you create a more customized platform that meets your specific business needs. On the other hand you’ll have to take the time to familiarize yourself with the marketplace and figure out what apps are available vs. what you need. That’s a little disappointing for an out-of-the-box feature set, but there is a lot of potential here. If you want extra features like loyalty programs and value-added features you’re going to have to pay for those by purchasing 3rd party apps in the marketplace. You also have the option to add the Register Software for a monthly fee which includes these apps and many more. In addition to the 3rd party apps and those apps available from Clover, the system offers an open source programming model with API integration – that means you can work with a developer to have applications created specifically for your business. Clover has a lot of potential to be a great POS system, especially with a comprehensive and open source application marketplace. This allows you to truly customize the experience and functionality of your POS system. Out of the box it’s a little barebones, which is surprising considering the initial price point. The robust reporting does make it a great tool for managing your business if you can get past the higher startup cost. The Clover® name and logo are owned by Clover Network, Inc., a wholly owned subsidiary of First Data corporation, and are registered or used in the U.S. and many foreign countries.